Chairman of Star Bulk Carriers Corp.
Born in Athens in 1955, he studied Economics at the University of Athens and earned his Masters Degree in Business Administration from INSEAD in France (1979). Apart from Greek, he speaks English, French and Italian fluently. He is currently the CEO of Oceanbulk Container Carriers LLC, an owner and manager of container vessels, since January 2015. He is also Non Executive Chairman of the Board of the Nasdaq listed shipping company Star Bulk Carriers Corp., while he served as President and CEO of the same company from February 2011 until July 2014. Both shipping companies are majority owned by Oaktree Capital, a US private equity fund. Non Executive Chairman of the Board of Euroclinic, a private hospital in Athens, as of 2011. 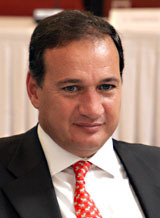 From 2004 until 2010, Mr. Capralos served as Executive Chairman of the Athens Exchange and CEO of the Hellenic Exchanges Group. From 2008 to 2010 he also served as President of the Federation of European Securities Exchanges (FESE). From 2000 to 2004 he has held the positions of General Secretary for the Olympic Games and of the Executive Director and Deputy Chief Operating Officer of the Organizing Committee for the ATHENS 2004 Olympic Games. He has been Executive Deputy Governor of the National Bank of Greece, (1991-1993), Managing Director of Epirus Co., (1994-1997), Managing Director of EFG Balkan Investments,( 1997-2000), following a ten year international banking career ( 1979-1988) with Bankers Trust Company in Paris, New York, Athens, Milan and London.